Description of "Blind the Eyes"
In a drowned city where hope kills and dreams are deadly, one wrong thought can end your life. Haunted 17-year-old outcast Cole is desperate to suppress her macabre obsession with the Mara-taken before she becomes one. When a stranger with unsettling gold eyes offers a chance to escape her rule-bound existence, it--and he--proves a dangerous distraction. The body count is on the rise and the ghost who won't leave her side isn't the only one with something to hide. Join Cole on a mission of discovery and revenge from the perilous heights of the Towers of Refuge to the glittering club lurking below the floodwaters. With the dead piling up at every turn, can she untangle the lies and stop the dying before the nightmares eat her alive? A not-quite-alive girl and her not-quite-dead ghost discover trusted authorities lie, allies have their own agendas and even the monsters wear masks in a journey of betrayal, revenge, and finding the power to fight back. YA dark fantasy with echoes of Daughter of the Burning City, This Savage Song, The Phantom of the Opera, and The Masque of the Red Death for fans of Brenna Yovanoff, Laini Taylor, and Melissa Marr. Read the atmospheric and twisty paranormal gothic horror-meets-dystopian action hit named one of Barnes & Noble Press's 20 Favorite Indie Books of 2018 today! Kaie has been creating urban legends about witches in the back wood and fairies in the snow melt since she was seven years old. She writes prickly misfits challenging the borders of the mundane, inspired by current stars Brenna Yovanoff, Kendare Blake, and Laini Taylor, and fantasy legends J.R.R. Tolkien, C.S. Lewis, and Madeleine L'Engle. Born in Vancouver, BC, she freelances as a business writer and marketing consultant in the Pacific Northwest. 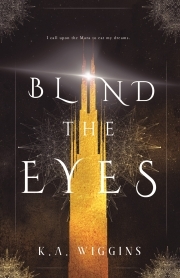 Reviews of "Blind the Eyes"